We all like a giggle. 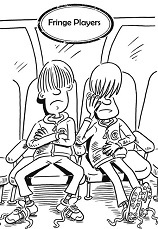 Clive certainly does, so he had a whale of a time writing Wayland's new Football Joke Book. It's 96 pages of footie gags, stories, limericks and fun cartoons by Alan Rowe and some amazing but true football facts. So, if your computer has the bad-goalkeeper virus and can't save anything, why not cheer yourself up with some footy fun? Click on Football Joke Book to have a peek inside its pages. Do you feel your childhood years dragging by? Are you bored or fed up? Can't wait to be an adult? Whoooah! Enjoy the few years you have left with this great set of challenges to amuse, amaze, revulse and terrify. From bogs and snogs to pants and rants, no part of everyday life is left untouched by the 100 plus challenges (we called it 101 but I've squeezed in more than 130 different things to do). Each is graded according to cost, effort and fear and feelgood factors and there are TK ranking points for each challenge which go to your final score. Download three sample TK Challenges including a Trolley Grand Prix for Free! 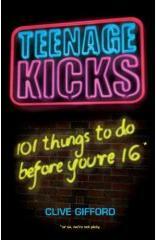 “Teenage Kicks is a barmy, brilliant and hilarious odyssey of a book where the point is to build up a ‘TK’ score by completing 101 things to do before you’re 16. And given the list takes in everything from a shopping trolley grand prix, to the best custard pie, and from seeing the sunset on Macchu Picchu to learning to juggle, there really is something for teenagers (and adults who still think they are) everywhere. And it isn’t all about fun, either. Gifford’s social conscience is also firmly in place, with energy-saving, tree-planting, recycling and helping the aged all making appearances. And, for awkward teenagers across the nation, first kisses and getting over that teenage crush are also accounted for. Teenage Kicks is the perfect companion to any bored teenager, and is just as fun, interesting and entertaining for the rest of society as well. Youth wasted on the young? Not anymore! – Gavin Gerlach, International Writing Magazine. The official guide to the first film of Philip Pullman's masterful Dark Materials trilogy. Packed with movie scenes, the book explains Lyra's world - from Oxford to Svalbard - and the extraordinary characters that inhabit it from Iorek and Serafina to Mrs Coulter and Lee Scoresby. If you want to know more about daemons and the alethiometer as well as much more besides this is the book for you. Dan Brown’s epic hybrid of religious symbolism, conspiracy theory and action adventure has captivated millions. This book provides readers with a real challenge to recall as much detail as possible to answer the 1,050 questions on the book and Brown's other thrillers including Angels and Demons. Musical madness reigns in these two fun stories for young children. Meet King Zing and his amazing quest for the perfect sound with which to end his best ever song. And see how Kit the pig plans to save Jim Peapod's farm by taking the Hip Hop Hog pop song all the way to number one! 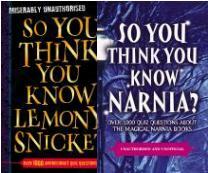 Two of the most popular series of children's books, one current and one enduringly popular, are the targets of the latest So You Think You Know (SYTYK) quiz books. Published by Hodder Children's Books, they both contain over 1000 questions, each carefully graded in one of three difficulty levels. ABC Television gives SYTYK Lemony Snicket a 10/10 rating. A headstrong boy, the best player in the Star Games Arcade. A tomgirl, with plenty of attitude, who turns out to be just as good as him. Has Arthur met his match? Will Martha win or lose? Or will they work together to overcome the greatest Virtual Reality game on the planet? Poor Jude! All she wanted was decent school dinners. But after travelling through a magic hoop, she's discovered a whole new meaning to the phrase, "we're having you for dinner." Can she escape from the Stew of Doom cooked up by the evil Witchipoo? One of the original fiction stories in Hodder's Superphonics range, other titles by Clive Gifford include the arrival of a strange visitor in Robot Roy and a retelling of the classic Goldilocks story with a bear sneaking around the house of The Three Clares. 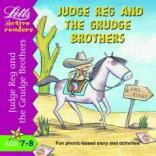 Judge Reg saunters into Lamb Ridge, a frontier town that is in the grip of sheep rustlers and downright bad varmits, the Grudge Brothers. He manages to arrest the Grudges' little sister, Madge, but his biggest test is to come. Rounding up the Grudges will take every ounce of cunning in his tiny frame. Clive writes: "I've always enjoyed reshaping and retelling adult stories in a form younger readers can enjoy. Working directly with the magazine's Editor-in-Chief, Jenny Curran, I condensed and rewrote such classics' as Mary Shelley's Frankenstein, Poe's The Pit and the Pendulum and the Bram Stoker classic, Dracula which were serialised over a number of issues." Clive writes: "Frequently only told from the side of the foreign troops stationed there, I really wanted to look at the conflict and how it impacted on ordinary Vietnamese people. By giving the family no direct role in the conflict, but including them in a subplot featuring proponents of the many sides, I sought to get across the sheer complexity of the war and the many varying arguments and views held within the country during the war. Building an arresting adventure plot was imperative as was weaving in factual events around fictional characters. I hope the eventual book is both entertaining and illuminating." "A taut, gripping and surprising story, confidently written." Clive writes: "I was asked to write eight short, original rhyming stories for the Ladybird Phonics scheme. Amongst them were the tale of a brave, some would say foolhardy, daredevil bird called Stunt Duck as well as a vain Wild West marshall called Sheriff Showoff." The Prime Minister’s Toupee has been stolen. Operation Slaphead is a daring mission to recover it. At the command of head spymaster, Sir Norman Largejowls, you’re put in charge of the most useless bunch of recruits to ever grace the Really Useful Spy School. Can you prevail and overcome cunning master über-villain, Dr Tongs? Plotbusters were complete, full length comic novels with a twist. Divided into text blocks and with options throughout, they gave reluctant readers a chance to influence the plot and outcome.